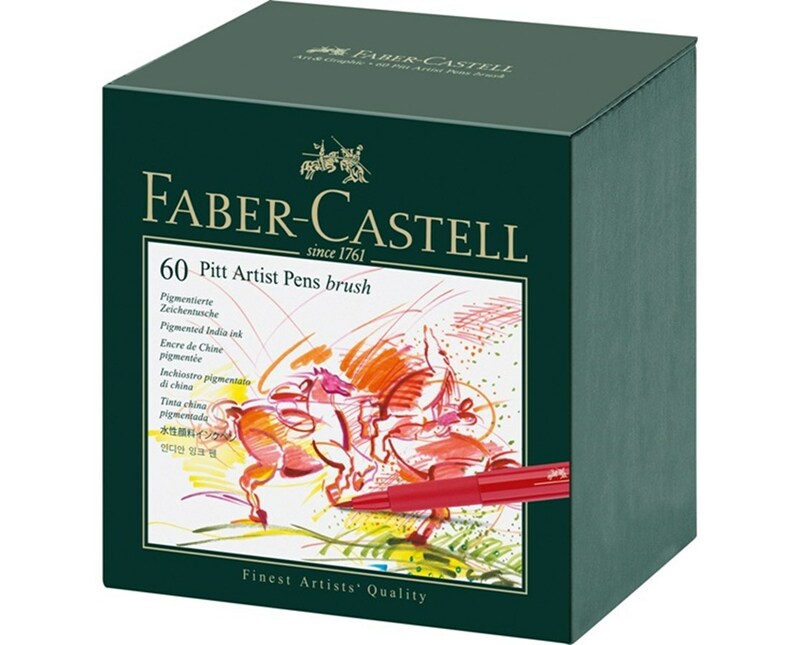 The Faber-Castell PITT Artist Brush Pen Set is a must-have drawing tool for all coloring, writing, and drawing needs. 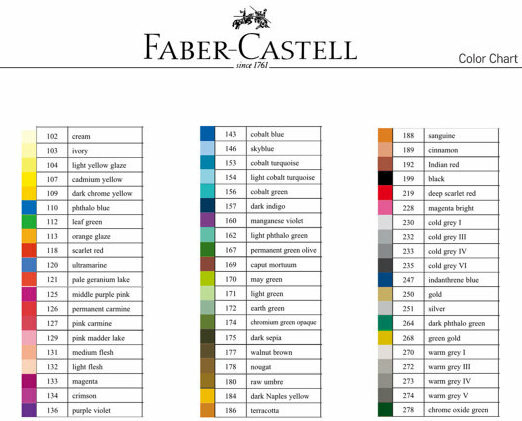 With a wide range of color variations it offers, it is versatile and accommodates many applications. 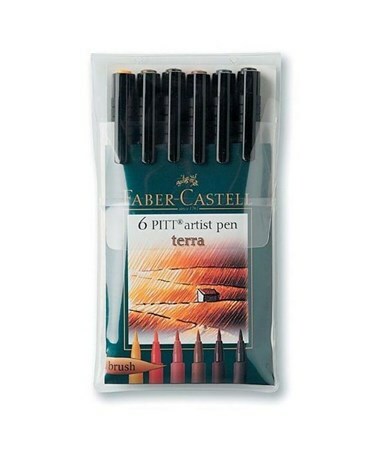 Each package contains six or 60 pieces of brush-tipped PITT artist pens in different vibrant colors. 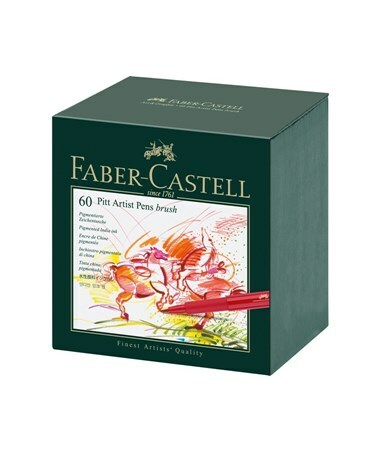 The Faber-Castell PITT Artist Brush Pen Set uses pigmented India ink that is lightfast and permanent. Preferred by most professionals, its acid-free and pH-neutral ink is fade-resistant and water-proof ensuring archival quality drawings. 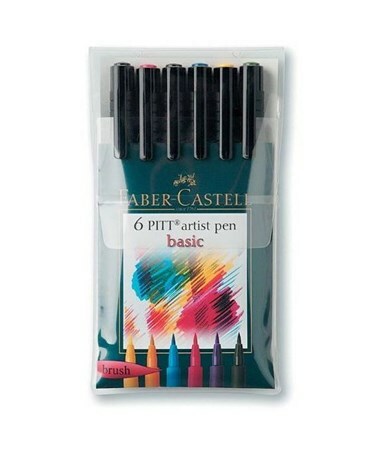 It is equipped with polypropylene shaft and cap to prevent the ink from drying out quickly. 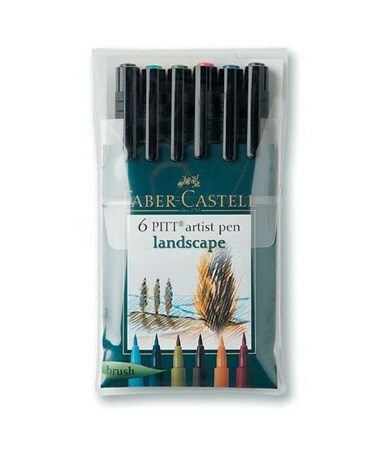 The Faber-Castell PITT Artist Brush Pen Set comes in various package options. Please select your preference from the menu above. 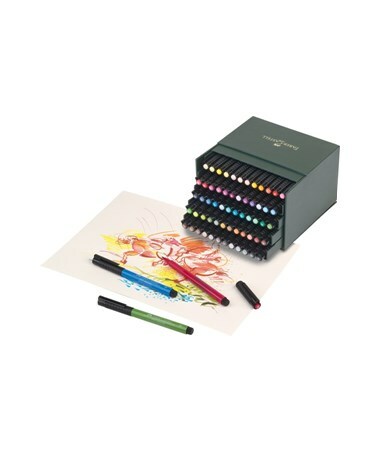 This package includes: Cadmium Yellow, Dark Chrome Yellow, Pink Carmine, Phtalo Blue, Manganese Violet, and Permanent Green Olive brush pens. 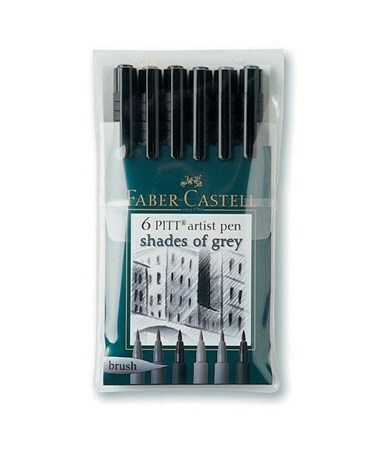 This package includes: Cold Grey III, Cold Grey IV, Cold Grey V, Warm Grey III, Warm Grey IV, and Warm Grey V brush pens. This package includes: Smalt Blue, Indianthrene Blue, May Green, Chrome Green Opaque, Green Gold, and Indian Red brush pens. This package includes: Dark Naples Ochre, Terracotta, Cinnamon, Raw Umber, Caput Mortuum, and Walnut Brown brush pens. 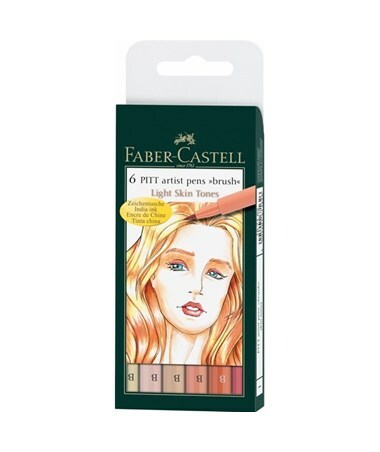 This package includes: Ivory, Light Skin, Medium Skin, Medium Flesh, Light Flesh, and Cinnamon brush pens. 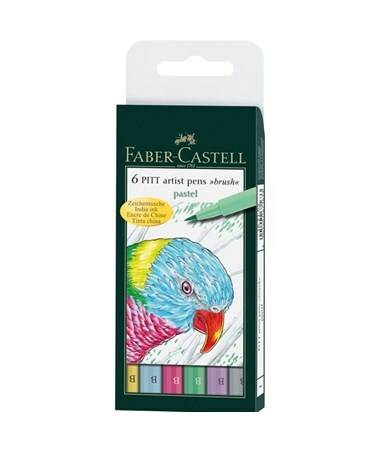 This package includes: Light Yellow Glaze, Pink Madder Lake, Ice Blue, Light Phtalo Green, Cold Grey I, and Lilac brush pens. 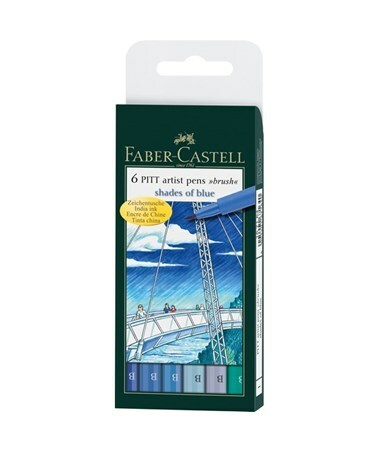 This package includes: Ultramarine, Cobalt Blue, Sky Blue, Ice Blue, Cobalt Green, and Light Indigo brush pens. 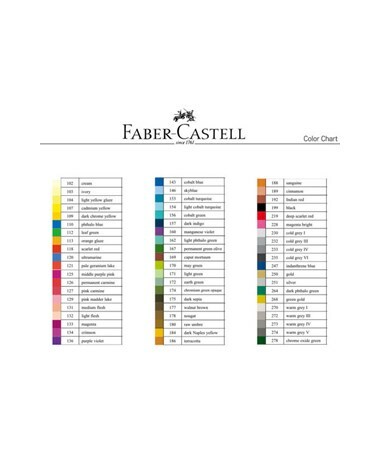 This package includes: Black, Bright Magenta, Cadmium Yellow, Caput Mortuum, Chromium Green Opaque, Cinnamon, Cobalt Blue, Cobalt Green, Cobalt Turquoise, Cold Gray I, Cold Gray III, Cold Gray IV, Cold Gray VI, Crimson, Dark Cadmium Yellow, Dark Chrome Yellow, Dark Indigo, Dark Phthalo Green, Dark Red, Deep Scarlet Red, Earth Green, Green Gold, Ice Blue, Indian Red, Indanthrene Blue, Ivory, Leaf Green, Light Cobalt Turquoise, Light Flesh, Light Green, Light Indigo, Light Phthalo Green, Light Skin, Lilac, Light Yellow Glaze, May Green, Medium Flesh, Medium Skin, Middle Purple Pink, Nougat, Orange Glaze, Pale Geranium Lake, Permanent Green Olive, Phthalo Blue, Phthalo Green, Pink Carmine, Pink Madder Lake, Purple Violet, Raw Umber, Sanguine, Scarlet Red, Sepia, Sky Blue, Terracotta, Ultramarine, Walnut Brown, Warm Gray I, Warm Gray II, Warm Gray IV, and Warm Gray V brush pens.